Is your house a burglary dream? Recent research from AXA has revealed that burglars tend to head for house number 88. Strange as it may seem, their research reveals that this house number appears to be the most attractive for uninvited, law-breaking intruders. You may have thought that the traditionally unlucky number 13 would have been most at risk – but in fact, according to the research, it’s around half as likely as 88 to be hit by thieves. According to the insurer’s research, other popular house numbers in the burglary line-up are; 80, 68, 91, 96, 13, 73, 79, 77, 78, 83, 87 and 98. So, what other traits are there for house break-ins? Is your home top of the burglary hit-list? Where you live can affect your likelihood to be burgled. Last year, Yorkshire Bank conducted an analysis of crime statistics to reveal the areas with the highest and lowest burglary rates. Unsurprisingly, the City of London had the highest burglary rate – in fact, the rate of burglary per 1,000 people was more than four times higher than the UK’s national average. Burnley, Manchester, Nottingham and Bristol made up the other top 5 burglary hotspots. The crime statistics for your local area can affect the risk profile of your property. This is why your postcode has some bearing on your home insurance premiums. With the introduction of the online crime mapping from Police.uk, you can now view crime data for your local area at street level. Security features are an obvious deterrent, a burglar is far more likely to target a property that has no evidence of an alarm or security light. 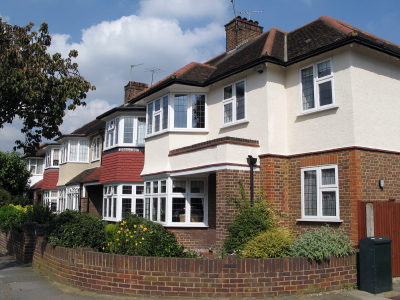 In research carried out by Halifax last year, it appears that more modest semi-detached properties worth around £153,000 are an ideal target for thieves. This is supported by further recent data from AXA which shows that those living in semi-detached houses are more likely to be the victims of a break-in than terraced or detached residents. A purple front door, apparently, also seems to attract thieves. A survey of criminals on remand showed that would-be thieves look out for an area that’s nice…but not too nice. Rather than swanky city apartments or large, high value properties – a middle class semi detached is the perfect picking. Swankier, higher value properties are often not targeted for the the fear of top of the range security features that make them trickier to break into. Game consoles, mobiles and jewellery were found to be top of the shopping-list for intruders – so make sure these items are always stored out of sight. If your property appears unoccupied, it could well encourage an opportunist burglar to target it. Always give the impression that your home is inhabited when you’re away on a trip. This could involve putting your lights on timers, cancelling any daily milk/paper deliveries and asking a neighbour to check on your home and draw the curtains.